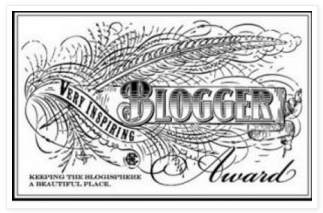 I was recently tagged by TriMOEngr over at Climbing Those Hills for the Very Inspiring Blogger Award. Thanks, girl! 1. Reason #1 why I need to stay away from Target. Tucker and I just polished off this bag. I hope he ate at least half of the bag. 2. Izzy still takes a bath in the sink. In my defense, it's a very deep sink. Plus she's still happy in it. 3. I am VERY nervous about starting a new job. 4. Two days ago we came home with a cat from my dad's house. I am quite nervous about this cat. He was actually my mom's cat (who passed away nearly 6 years ago). My dad is going to be traveling a lot and didn't want to leave the cat at home for long periods of time. Plus, our cat disappeared a couple of months ago, which meant Tucker was missing a kitty buddy big time. We've always been an indoor/outdoor kind of cat family, but this not this cat. I can't bear to have something happen to it, especially since he was my mom's cat. welcome to your new home, Rocky! 5. This year I spectated Beach to Beacon. 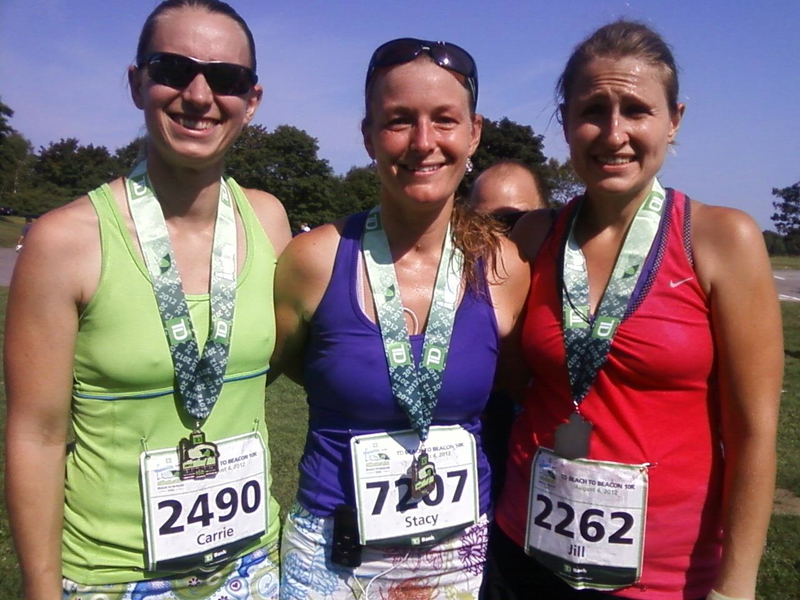 I have to say, I had far more fun as a spectator than a runner. Did I want to run? Nope. Not at all. It was incredibly hot that day and tons of runners got sick. Plus I got to see my girls running! 6. Since Tucker has a new Kindle Fire, I have kind of made him let Izzy play with his old iTouch. Is that really bad? It keeps her happy and hands off of the Kindle. So I'm thinking it's okay. 7. This summer I flew through the 50 Shades series and then I read Bared To You (a very similar type of book). I've looked at other books but nothing is catching my eye. Do you have any suggestions? I always go through a withdrawal period after I read a series of books. The last time I got into a book was the Twilight series when I was pregnant with Izzy. Oh wait, that's not true. I did enjoy the Hunger Games series as well. Okay, yes, I do have a problem. I love reading jr high leveled books. Okay - now for my taggees. I know the rules said 15 (or less). I'm sticking with the or less on this one. Especially since I just tagged a bunch of bloggers last week! Thanks for the tag! I am with you on the book withdrawl thing--after I finished the Hunger Games, all I could do was keep rereading them because nothing else could hold my interest! Same goes for Twilight! :) If you liked Hunger Games, check out Divergent and Insurgent by Veronica Roth. That sink picture is hilarious, and adorable! I always get really nervous before a new job too- use that nervous energy to fuel your creative preparation, you'll be great! Thanks for the tag! I'm still bummed I didn't get to run B2B this year and meet you IRL, but I will try again! Nothing like a big farm sink-we still have the original sink that we pulled out of our house on the farm when we moved in and remodeled. My dad is convinced he will have it in his workshop once they move. Hope you guys are enjoying having Rocky in the house! 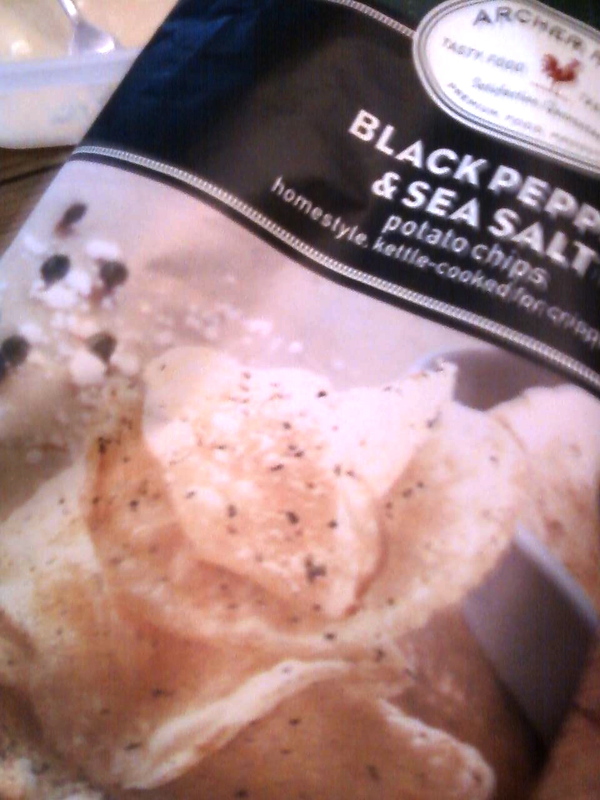 Have you ever had the Sea Salt and Cracked Pepper baked Kettle Chips?! Oh my mmMMM! Good luck with your new job! How exciting! I don't even go down the chip aisle in Target anymore. to dangerous as you know. Now we both have cats named Rocky. Rocky is so adorable, as I said before! Just make sure Ward keeps the door closed so that nothing happens to Rocky! 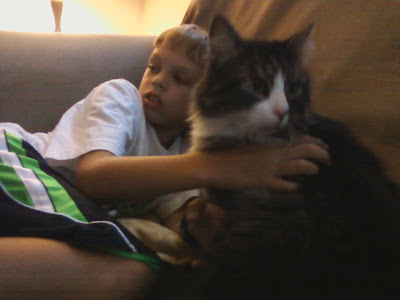 Our first family cat was indoor/outdoor and coyotes got him, he was older but not really old. After that the rest of our cats were indoor only. You will do great at your new job! I've been reading a lot of non-fiction lately (though I did finally read the Twilight series this summer in about a week - I also like the tween fiction LOL). I'm currently reading "The Grace to Race" about the Sister Madonna Buder (aka "The Iron Nun"). Man she is inspiring! I just finished "Lance Armstrong's War" which was relatively interesting, but I liked "It's Not about the Bike" better. Over the last year I've read a ton of biographies on various endurance athletes and really enjoyed most of them (you might check my blog for some of my book reviews). You'd probably like 50/50 about Dean Karnazes' 50 marathons in 50 states in 50 days adventure. I had the same problem when i finished the 50 Shades trilogy. The best books i've read since then are One Fine Day by Theresa Weir (not the same as the movie that starred George Clooney and Michele Pfeiffer. Not. At. All) and i'm currently reading Garden of Lies by Eileen Goudge. It has consistently kept me up WAY past my bedtime for the last three nights. Are you on Goodreads? Best of luck on your new job!! !